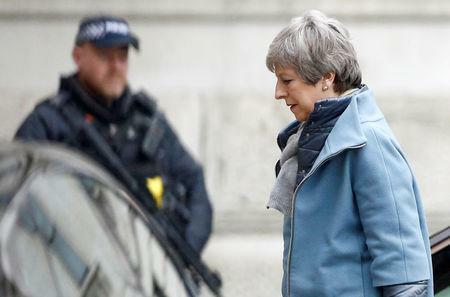 LONDON (Reuters) - British Prime Minister Theresa May's top ministers are moving to oust her within days, The Sunday Times reported, as her Brexit strategy lay in tatters just weeks before the United Kingdom was due to leave the European Union. "Her judgment has started to go haywire. You can't be a member of the cabinet who just puts your head in the sand," the newspaper cited a second unidentified minister as saying. "I’m advised (Michael Gove) would also go for Customs Union plus single market with Labour votes," Steve Baker of the eurosceptic European Research Group (ERG) said. The Sunday Telegraph reported that former education minister Nicky Morgan, who voted remain, was popular among several prominent pro-Leave lawmakers as a "unity candidate" to succeed May.